Yo, want to see something cool? Climate change is an outright hoax peddled to the masses to provide justification for the further erosion of our human rights. Climate change has been bandied about and still to this day we hear over and over about how climate change will destroy the world, which makes it sound more and more like a religion. The problem is Hansen had it all wrong. His wild predictions garnered attention and agreement from a host of international "experts." But alas, temperatures haven't risen near the levels predicted. The scientific community predicted massive rising sea levels which never materialized. Hansen and his merry band of alarmists predicted with great certainty stronger hurricanes, stronger storms and much stronger tornadoes. The National Oceanic and Atmospheric Administration says evidence since those predictions dispute every claim made by the alarmists. But Hansen and his models were not through. In 2007 and again in 2016, Hansen trotted out a laundry list of disasters right around the corner that would threaten the future of mankind. Trouble is, not one of those predictions has proven even close to accurate. After doing a search, and being unable to find a thread dedicated to the climate change hoax, I'm starting one. Global Warming doesn't exist. It's just a con. I still remember the BBC telling us in 2000 that, because of Global Warming, children in Britain will not know what snow is by 2010 because they'll never see it. Of course, it was wrong. Climate Change is not about simply eroding human rights, its heart is in global governance. The people/organizations with money seek to secure their power by scaring the world populations into subservience under the threat of global catastrophe. The poor countries and populations are easy to gain power over, but even these global elites don't have enough money to just pay them off so they have to employ governments to do the work for them. Anthropological global warming is, almost, a perfect vehicle for such control and influence over population sin "free" (so called) societies. The leaders in "free" societies are generally, but not always, complicit in these plans for a socialist/communist world, either knowingly or unknowingly, with these global powers and business entities. Leaders of businesses, such as that of Facebook/Google/Amazon/etc are key to gaining the control of the information about people that is necessary to target key opposition and push the propaganda that's needed to accomplish the goal of world government. The major media organizations (CNN, MSNBC, CBS, NBC, etc.) are all complicit in the dissemination of this propaganda that scares people into believing they can't survive without big government (i.e. using the heavy hand of environmentalism.) Often times this is disguised as socialist ideological values but the real effort is to have people in the "free world" adapt their expectations of government to be more communistic because that's the societal structure where true power and oppression of opposition can be realized in order for the elite to force upon you what they think is best for you and society. Just hope that you are not on the wrong side of their opinion about your place in society because they will bring down hell to eliminate you and your influence against their power. In the end, Anthropological global warming is a key scheme to get governments to establish control over their populations through the umbrella of trying to prevent global destruction of the Earth. If you can get countries to voluntarily redistribute their wealth to poorer countries then the elites can establish control over those smaller and poorer countries, similar to how people become dependent on government under socialism and communism. Then at some point when every is adapted to large scale government for their "supposed" survival on Earth, you start bring governments together under one umbrella which then leads to true global government. Secondly, the global elite can't really control the weather so even though anthropological global warming is, almost, a perfect vehicle, it's only such if the weather cooperates, which it hasn't. Dispite over a 30% increase in the amount of green house gasses in the atmosphere we have not seen comparable increase is surface temperatures. Nor have we seen increases in storm activity or natural disasters. Some will link to some studies that try to claim huge increases in natural disasters but the data is manipulated to promote that idea, but if you look at the raw data, even in studies that claim it, just doesn't support it. In the end, anthropological global warming will be proven by science to be just as unsustainable as socialism in a society. Socialism doesn't work because eventually you run out of other people's money to spend. AGW doesn't work because eventually science, if not corrupted, and the environment show that it just doesn't exist. Is this why it took many governments - especially the US - so long to even consider the possibility that what scientists had been telling them for decades might be true? The only conspiracy is why those with money and power rejected the idea for so long (and in some cases continue to do so). No, the earth goes round the sun, I'll admit that one. I used to believe in climate change too, earlier this year, starting in about March, the weather did start to get much warmer, and I started to really worry. By mid July it was really hot, I was frantic. I thought by, say December, we'd all be dead. But, and this is what opened my eyes, now it's cooled right off again. So that proves it's not getting progressively warmer. So I think them so-called scientists either got it wrong, or they're being told to say that by the Bilderberg group to make me buy t-shirts, which are expensive, thereby financially weakening me and making me pliable to their will and more mouldable. Also, Dennis Healey, was both a socialist and a Bilderberg, so that proves there's a connection. Why "especially" the US? Most governments around the world aren't bothered about "climate change" and probably don't even believe it. The Chinese and Indian governments certainly aren't doing anything to combat this non-existent thing. China is to build 700 coal-fired power plants over the next few years. It's only mainly PC Western governments that are obsessed with "climate change". The rest of the world, meanwhile, doesn't give a damn and just carries on as normal. Meanwhile, China is the world's largest builder of wind farms and other renewal energy plants. However they - and many other countries - also need coal power station to meet the ever growing demand for the same quality of life and reliable electricity that we take for granted (and, in some case, seem to think that the rest of the world should not have). Although most of your post was just you being ridiculous, Still, I don't think those in power and wealth really care what government vehicle they use to keep and build that power and wealth. Capitalism only can get you so far in those metrics due to competition and free market choices. Any system that removes competition from the equation and solidifies power and wealth is all they want. Socialism is just a stepping stone to the world order that they want to see in place. What they really want is people to think they're free but in reality they have little choice as to how to live their lives. When anthropological global warming falls away because it's just not reality, they'll be fine with the fascist governmental institutions that helped impose control over society in its name. I know where I live our energy prices have gone through the roof by hundreds of percentage points over what we paid decades ago. And get this, if you installed solar and have it feeding into the grid than you actually pay more because every year the power companies (in league with the State) send you a "true up" bill to make you pay what you didn't pay through the year because of your solar offsets. If the State truly believed in the global warming BS they wouldn't try to screw you over for supporting renewable energy at your home after you've spent tens of thousands of dollars on solar. It's all BS and not even the government believes it's a problem, all they care about is the money. Says the man living in a socialist state and is fine with it. LOL. I don't believe in climate change crap. And even if I'm wrong I do believe that people are going to do what they do and money actually does run the world...so if fossil fuels is causing clinate change...ya better just buy some suntan lotion and move to higher ground cause they are NOT going to quit oumpming andysi g oul till it runs out or they get situated to make more out of something else...that's what I expect will happen. Just my opinion. What a joke, where in the h3ll do you get the number "ten thousand." There's not that many climate scientists in the world. There's hundreds of them at best and many of them question anthropological global warming, that is, that global warming is caused by humans. But since you used such a fantastical number I'll assume such just for the sake of argument in this post, even though it a lie. Now, since 100% of the climate models based on human behavior, that came out of these supposed tens of thousands of reputable scientists, have failed to predict our current climate situation then I'd guess that yes, all tens of thousands of them must be wrong because...well...they are wrong by mear examination of the current scientific measurements. That is, until they start modifying the historical temperature records down to try to fudge the numbers to show an increase that just doesn't exist in the data. The real truth is that they don't know what makes the climate tick yet (if ever,) they have only guesses and being that their continued funding comes from climate research they have a vested interest in making dire predictions. If their predictions where that there's nothing to worry about then their funding would dry up. But the government has been known to try to affect consumer practices by raising taxes on behaviors they don't like (ie. cigarettes) and giving tax breaks on behaviors they do like (i.e. homeownership, electric cars, etc.) Essentially it's a form of slavery by taxes. At first they just tried to destroy the fossil fuel industry just by regulation and taxes on coal mines but that apparently didn't work now that those regulations and taxes have been removed by a new administration and coal mines are coming back into business. Next, they may go for the consumer's wallet. Who knows? All I know is my electric bills are through the roof compared to what they were a decade or so ago and much of that has to do with the way government controls the electric industry. I'll never forget when Obama once said, "Under my plan of a cap and trade system, electricity rates would necessarily skyrocket." along with this promise to bankrupt anyone foolish enough to build a coal-burning power plant. It should be no wonder that using taxes and regulation is how they plan to force society to do what they think is best for us even though climate models have not shown the science is evolved enough to necessitate making such drastic measures. The south east Missourian telling the world how it really is! 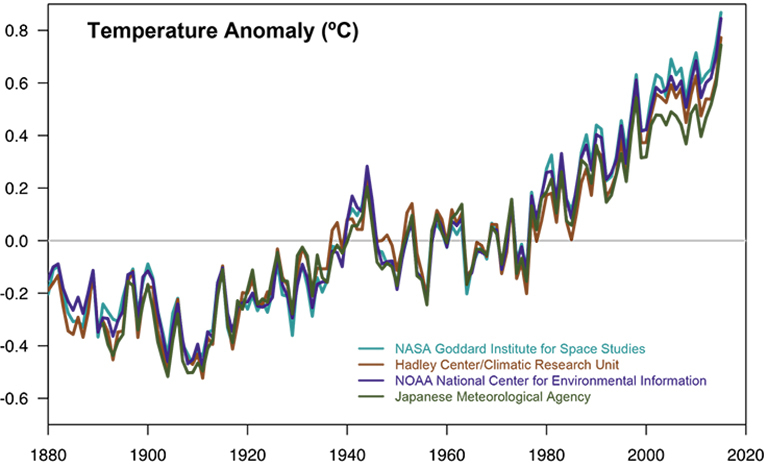 Instead, a site supported by NASA and dedicated to Climate Change shows temperature anomalies to be real and proportionally speeding upwards in the last twenty years. Also there is strong belief among the scientific community and the dedicated and specialist organisations who believe that not only Climate Change is real but caused by man. Now, if you believe that the most intelligent human beings on this planet (Scientists and Academics) are all in cahoots with Govts around the world to subdue the populace, well yeah, pigs fly too. Your human rights to do what? There is still that pesky fact that none of their doom and gloom predictions have come to pass. Climate so-called scientists are like evangelical Christians trying to tell us that Jesus is coming back. Just like the latter are always telling us that the apocalypse is always around the corner, just wait, so are these so-called scientists always telling us that climate change doom is always around the corner, yet that doom never materializes. Also, its well known that our modern universities no longer educate to train people to think critically, they educate to indoctrinate. Our entire education system in the west works to constantly reinforce the false notion that truth comes from authority. Whether its happening or not it wouldn't hurt to care for the planet a bit better.The place is a pit. The Earth is naturally changing, regardless of human presence. What about the growing world population? Bound to affect global resources. This should be the world government's main focus. What a joke, where in the h3ll do you get the number "ten thousand." There's not that many climate scientists in the world. There's hundreds of them at best and many of them question anthropological global warming, that is, that global warming is caused by humans. I am not aware of any who think that - even sceptics like John Christy accept AGW, they just question how significant it is/will be. So you suggest keep going the way we are despite scientific evidence showing fossil fuels increase co2 in the atmosphere which causes heat to be trapped making the place hotter and ice in the polar caps to melt causing sea levels to rise? Not to mention deforestation which reduces oxygen, the essential element for our existence. Nah you know what, I'm with you, to hell with all education, social geopolitics and society in general. Everyone's a crook. Let's become anarchists or even better nihilists. Lets reject all evolutionary advancements and go back to living in caves. "The Earth is naturally changing, regardless of human presence." and then you lay out statistics on population growth.